Dusk is prime time for heading back outside. Enjoy that good-exhausted feeling after a day on the beach, or out seeing the island. Ocean views make the bar/grill a must-visit. It's like a backyard BBQ at home, only here, your backyard is the Pacific. It's that close. Stake out a spot in the sand and enjoy. Whether you're cooking dinner, or collapsing on the couch - you're together without tripping over each other. 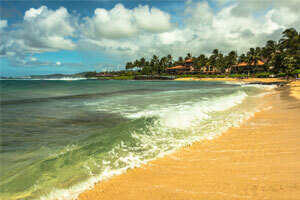 You're right on a coveted stretch of Poipu Beach Park. Take an evening stroll on the beach before an intimate candlelit dinner overlooking the ocean. Tropical flower gardens adorn lava rock grottos and the path to the beach. Enjoy beachfront convenience on beautifully manicured grounds that are breathtaking by day, and tiki-torch-lit by night. Your arrival at Marriott’s Waiohai Beach Club instantly puts you in full vacation mode, with hammocks for lazy afternoons and firepit lounging areas for relaxed evenings outside. When it comes to underwater fun, the resort has it all: a pool with waterfall, an adult pool and a special pool just for the little ones. The Honu Pool Bar & Grill keeps the snacks and drinks coming, or have a family cookout thanks to the BBQ grills. On the short walk to the beach, compete with the kids for the most wildlife sightings, reporting all of the tropical critters that you spot (birds count too). Back at the resort, let the little ones run around on the children’s playground before giving in to the kids’ request for ice cream with a visit to The Marketplace. Defend your foosball title in the activities lanai. If you’re up for some cardio, stop by the Fitness Center for a workout. With all of this, no wonder they were awarded a Certificate of Excellence from TripAdvisor. You’ll love all the space in your two-bedroom condo, which easily sleeps up to eight guests. Full kitchens have what you need to make and serve meals. Luxe touches like pillowtop mattresses and stainless appliances abound, and the in-suite washer/dryer is a practical but welcome perk. Check out the DVD kiosk in the lobby for your post-BBQ movie night thanks to the flatscreen TV with premium channels and DVD player. At the end of the night, gather the family on the private lanai and watch the sunset. Ready to venture beyond the resort? Ask the front desk about arranging side trips to see more of the stunning Na Pali Coast – or go tubing or ATV-ing through a former sugar cane plantation. Check out the shops and restaurants at Poipu Shopping Village. Beachwear and apparel for little ones can be found at Sand Kids. Did you know that Hawaii’s premiere board-sport lifestyle shop for women, Honolulu Surf Co., can be found at Poipu Shopping Village? Pick up a hand-painted ukulele to bring home at Fish Eye Kauai. Hungry? Olympic Cafe has local fish, pasta, and burgers. Island Taco is known for tacos that have local Hawaiian flavors. Or try a Hawaiian-style hot dog from Puka Dog. Gather the golfers in your party and head to the Robert Trent Jones Jr.-designed Kiahuna Golf Club. It features a challenging eighteen-hole course, a golf shop and a restaurant.